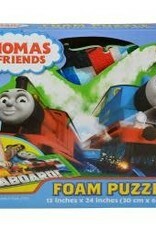 Watch Thomas come to life as you put together this super giant foam Thomas and Friends puzzle! Perfect for constructing on the floor, when assembled this puzzle measures 13 inches by 24 inches. Its large, soft foam pieces are perfect for little hands, and 25 pieces presents a fun challenge to young puzzlers. Great for kids who love Thomas. 25 piece Foam puzzle with your favorite Thomas and Friends characters. Put it together and use it as a play mat. A fun and challenging puzzle for kids of all ages!